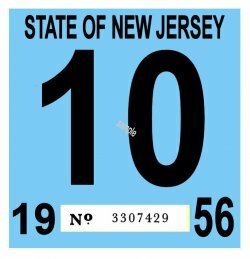 1956 New Jersey INSPECTION Sticker - $20.00 : Bob Hoyts Classic Inspection Stickers, Add a Final Touch to your Restoration! This 1956 sticker was the first of a new style issued by NJ in that year. This sticker has been digitally restored and reproduced identical in size and color both front and back. Ordered sticker will be a random month unless a specific month is purchased.